Description: The Western Small-Footed Myotis (Myotis ciliolabrum) has a light brown pelage with flaxen tips. It’s belly consists of white fur. Females are usually larger than males. The average length of this bat is 80 mm and the average weight varies from 4-5 grams. 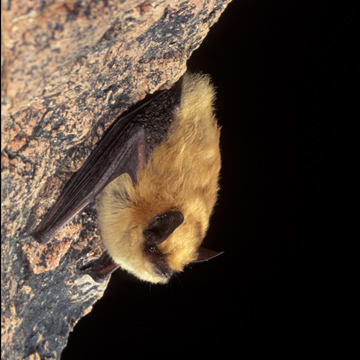 About the Western Small-Footed Myotis: This bat is known to hibernate in old mines in solitude. Canyon walls and crevices are also known as good roosts. Although a typically solitary species, small maternity colonies have arisen. Females have one pup.